Situated on the terraced hillside overlooking the bay of Isternia, the village of the same name lies between Kardiani and Pyrgos. 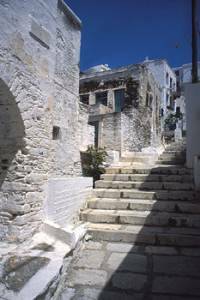 While not as often visited as Pyrgos, it does have plenty of marble adornments on houses, churches and in the pretty town square, as this village too is home to marble artists with a long tradition of carving. The view toward the sea from this village is very impressive. Perhaps that’s the reason the village is also home to many sailors and sea captains.